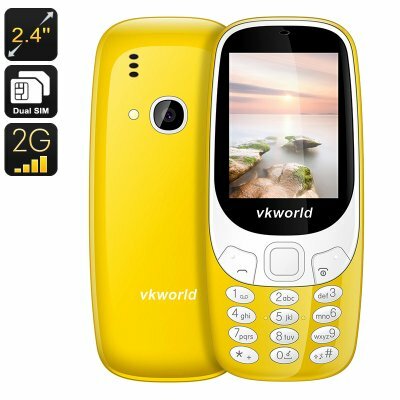 Successfully Added VKWorld Z3310 Cell Phone - 1450mAh, Number Pad, 2.4 Inch Display, Dual-IMEI, 2MP Camera, Bluetooth (Yellow) to your Shopping Cart. The VKWorld Z3310 is a basic cell phone that brings along great connectivity. It supports two SIM card slots and Dual-IMEI numbers. This means that you’ll be able to be connected to two network providers at the same time. Therefore, you’ll always be reachable on two phone numbers while using merely one mobile phone. With its Dual-IMEI numbers at your disposal, you can be guaranteed that you’ll always stay within reach to friends, family, and colleagues. With its durable design, this cell phone is extremely tough and has been designed to withstand a hit. No longer will you have to worry about accidentally breaking your mobile phone while dropping it on the floor. The VKWorld Z3310 furthermore comes with an extra-bright 2.4 Inch display and a number pad that features relatively large buttons. This makes the cell phone perfect for senior citizens that are simply looking for a mobile phone that treats them to all the basic features. By packing an epic 1450mAy battery, the VKWorld Z3310 mobile phone brings forth enough power to let you enjoy all its features for up to 16 hours in a row. This means that you’ll be able to get through multiple days of regular phone usage without needing to worry about battery life. Additionally, it supports a whopping 600 hours of standby time. Therefore, you’ll be able to carry along your phone for almost a month before it needs to be recharged. Its extremely long battery life makes this senior phone great for the elderly who do not think about recharging their cell phone on daily basis. The phone furthermore comes with 8GB external memory support, an FM radio, and a 2MP rear camera. This senior phone comes with a 12 months warranty, brought to you by the leader in electronic devices as well as wholesale mobile phones..
Not 4G compatible, so won't work with my sim card.